Alexis Bittar studded mesh tassel pendant necklace. Ruthenium-tone and 10-karat gold plated brass. Linear mesh pendant with mixed stone accents. Pyrite, labradorite and blue corundum details. 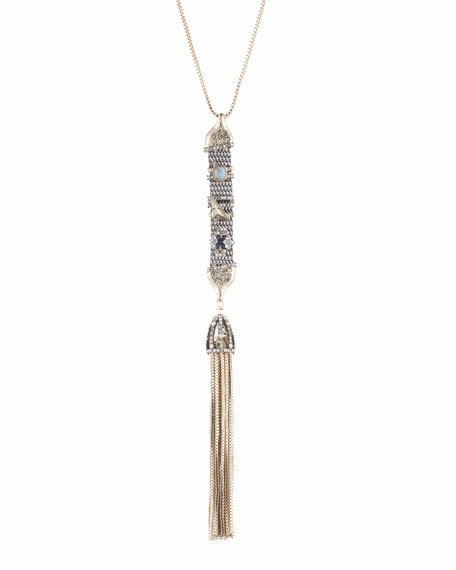 Multi-chain tassel with Swarovski® crystals. With every purchase Akola reinvests 100% of profits to empower women and families in poverty. Akola long multi-tassel pendant necklace. With every purchase Akola reinvests 100% of profits to empower women and families in poverty. Akola long multi-tassel pendant necklace. 18-karat yellow gold plating over brass. Smooth amazonite and glass beading. Tiered raffia multi-tassel pendant. Slipover style. Approx. 36"L. Made in USA. EXCLUSIVELY AT NEIMAN MARCUS Jose & Maria Barrera pendant necklace. 24-karat gold-plated brass hardware. Glass beads and cabochon stones. Multi-size Austrian crystal accents. Chain, approx. 34"L. Pendant, 6.5"L x 2"W. Made in USA. Kendra Scott Betsy Adjustable Fringe Pendant Necklace, 32"
Betsy fringe pendant necklace by Kendra Scott. Plated brass chain with adjustable slider clasp. Prong-set stone pendant with multi-tassel fringe.